Updated 2nd Edition. Adventures in Art Quilting. Jean Wells gives you the assignment of your life: put away your ruler and use your inner vision to design and piece spectacular, free-form quilts you'd never have guessed you could create. 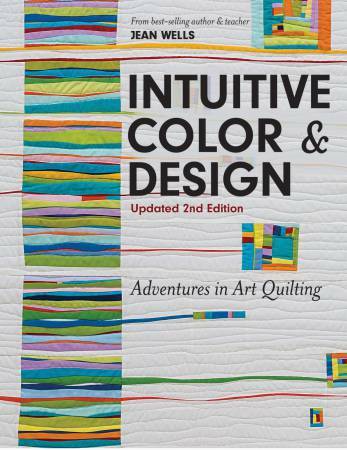 In this updated edition of best-selling Intuitive Color & Design, Jean's workshop assignments get your creative juices flowing, giving you challenges to expand your quilting horizons. Start by learning to see line and color; study the nuts and bolts of design; develop your color work and composition; and when you get stuck, there's expert advice on problem solving. You will never see quilt making in the same way again. 112 pages, color, 8.5x11in, by Jean Wells, Published by C&T Publishing.